Yesterday, as I was boarding a flight to Chandigarh, I got alerted about the fatal crash at Mangalore (IXE). I recall visiting IXE in May 2009 for a day trip. Recall landing on the scenic elevated table top runway, with red earth and palm groves on both sides. But it did give me jitters - the cliff edges were barely a few meters from the runway. This You Tube video clearly shows the precarious position of the runway. 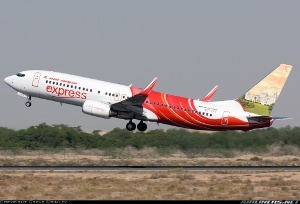 The plane involved in the fatality, operating as IX 812 an Air India Express 737-800, registered as VT-AXV was manufactured by Boeing in 2008 (shown in the photo alongside, from Airliners.net). The 737-800 is a modern fly-by-wire aircraft, leaving little room for pilot error. IXE is ILS equipped and VT-AXV was locked on to the ILS glide slope in its approach to the runway. So there was little room for pilot error on that count. It is reported IXE was having a touch of rain - probably an aftermath of Cyclone Laila. But still the pilots overshot the threshold by 2000 feet. Was there a sudden gust of wind that prevented VT-AXV from touching down? ATC protocol leaves the final judgement to the Captain and the First Officer. There was no distress call to the ATC. It is evident that the pilots were reasonably confident that the landing was manageable despite the overshoot. So did the reverse thrusters fail, did the flaps fail or did reverse thrusters fail to work? Or was the aircraft too overloaded to take off for a go around in the warm, wet and humid conditions? It is easy to blame the pilots for any crash, or rather quite immature to do so. There was an immediate backlash against expat pilots. (The Captain was a British national of Serb origin). What does his nationality have to do with the crash? Would an Indian pilot have done better? Aren't we being too judgemental? Aren't professionals supposed to take calls? Don't doctors, engineers, other professionals fail at times? Having said that, the VT-AXV crash was a human tragedy of unimaginable proportions. Carrying over 150 migrant semi-skilled workers back home, after toiling in Dubai for years, with dreams of a better life for their families back home, the crash crushed all those dreams. Can't agree more with you. Also, during the press briefing by the minister, the media was more interested in his resignation and stories around it than anything else. Do not know how it could have helped the case. The media, sometimes, really act stupid.